Many of us who love boating haven’t winterized our boat trailers or boats yet, hoping that we’ll get at least one more weekend when we can get out on the water. But the time to put them away is coming, and it’s coming soon. While you might be grilling all winter, the time to put the boat away is almost upon us. When you’re winterizing your old boat trailer, you might take a look at it and think that it’s time to get a new one. Maybe the old one is having electrical problems that you don’t feel like dealing with. Or perhaps that pothole you hit bent the frame and you’ve been worrying about it all season. 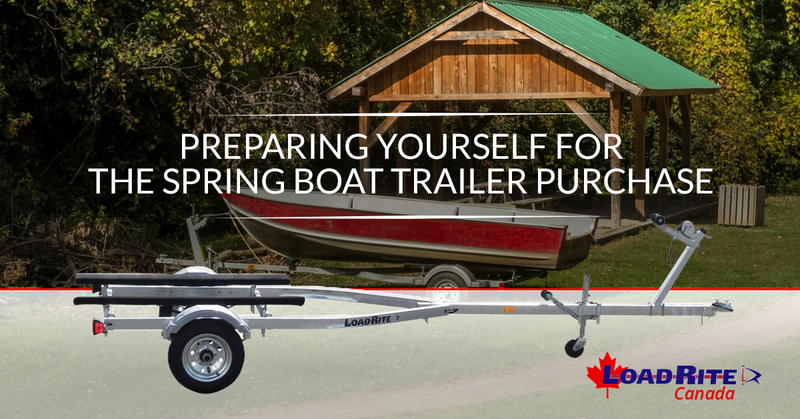 If you’re considering a new boat trailer, whether it’s a small boat trailer or you’re upgrading your boat and will need a large boat trailer, you have five or six months to get ready. While you’re not on the water, you’ve got some time to prepare for your new purchase. If you’re like most boaters and fishermen, you don’t stop thinking about boats just because it’s winter. So “doing your research” isn’t a task, it’s a hobby! You’ve got time, so be sure to research as much as possible. Are you looking for an aluminum boat trailer, or a galvanized boat trailer? Which boat trailer manufacturer has the best warranty? What are other people saying about them? Some people have been carrying too large a boat on too small a trailer, so they have to be honest with themselves and admit that it’s time to upgrade. We carry trailers for boats as short as 14-foot and big boat trailers for boats as long as 35-feet! Nearly every large purchase you make offers upgrades. If you’re buying a house, they’ll offer you granite countertops. If you’re buying a car, you have to decide how important seat warmers are to you. You can’t exactly get seat warmers on your boat trailer, but there are extras you might want to consider: spare tires and tire carriers, tongue jacks, extra brakes for trailers with additional axels, keel rollers, side guides, and plastic bunk covers are all excellent options. Let us know what you’re looking for and we can help. Compared to the cost of a boat, a new boat trailer isn’t really that expensive. But they’re not free, either, so it’s possible that you might just need to start saving up so that you can grab that trailer at the first sign of spring. Once you find the approximate price of the boat trailer with the length and capacity you’re looking for, divide that number by five and save up that much each month. We’ll See You In March! Even if you don’t plan to get your boat in the water until April, we bet we’ll see you at our Monkland or Innisfil yards before then. Most of us are itching to get back into the water long before we actually drop the boat in, so we see people all winter long. Give us a call at (647) 792-2580 to find out about our winter hours!